Per s.B. 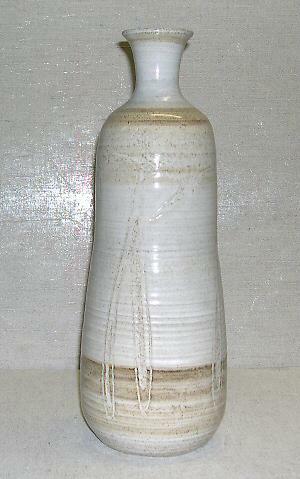 - Tall vase; stoneware; narrows to neck and ends in a wide lip. Glazed with thin, borwn overglaze. Marks formed in process of throwing the piece are used decoratively. Four abstract figures are scratched into the clay. Some figures' arms are hanging down, some are akimbo. Legs are formed of loops. Heads are indistinct. Bottom is glazed.